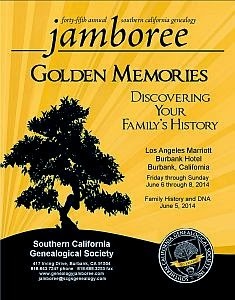 The Southern California Genealogy Society has asked that we spread the word about their FREE live-streamed sessions coming up next week, and I am happy to post them here. I love live-streaming events, and free is even better! You need to register to participate, so click through to the Jamboree website to see the schedule and sign up. The schedule of live-streamed Jamboree class sessions has been announced, with a total of 14 FREE live-streamed classes available for 2014. In addition, 5 of the Family History and DNA sessions are available on a pay-per-view basis. The sessions and registration directions are listed on the Jamboree website. We are very grateful for the support of our Diamond Sponsor, Ancestry.com, for underwriting a portion of the cost of the Jamboree sessions. Because we accept no sponsorship support for the Family History and DNA conference, those streamed sessions are provided on a for-pay basis. Viewers can purchase access to individual sessions, or they can obtain a Full-Day Pass to view all sessions at a discount. The DNA sessions will be available online for 30 days for those who pay for viewing. This is an exceptional opportunity to share in the skill and knowledge of Jamboree speakers. Advance registration is required at any time before the session begins. Please help us spread the word about these free sessions. They are offered as part of our ongoing mission to provide educational opportunities for family historians and genealogists around the world. Many of the Jamboree sessions will eventually be available in the webinar archive, which is accessible to SCGS members as a benefit of membership. The DNA events will not be added to the webinar archive. I received the following message from Michael John Neill, the author of Casefile Clues, about a special he is having on his genealogy methodology newsletter. If you have not read Casefile Clues before you may want to look at the variety of records, subjects and methods Michael discusses his series in the list of topics from volume 3 below. Grow Your Genealogy Research Skills Today With Casefile Clues! Casefile Clues contains well-written, easy to follow and understand, genealogy how-to material based upon real families and real problems. Issue 1- A Method to the Madness: Starting A Search for William Rhodus. Beginning a search on a man whose first "known" document is an 1860 marriage record in Missouri. Issue 2-"Know" Objection That I Know Of: Letters of Consent and a Bond from a 1798 Marriage. This column analyzes a set of marriage consents from the marriage of Thomas Sledd and Sally Tinsley in Amherst County, Virginia, in 1798. Issue 3-Thomas and Elizabeth Frame: Arriving Outside the Time Frame. This column discusses establishing an immigration framework for an English immigrant family to American in the 1860s. Issue 5-Copied from the Ashes: The 1850 Declaration of Peter Bigger. This column looks at a declaration of intent to become a citizen from Hamilton County, Ohio, that was recreated or copied from the partially burned one. Issue 6-A Venture into Harford County: A 1790-Era Grant and Deed. This column looks at two land records from Harford County, Maryland, the patent to James Rampley and the subsequent deed of sale for part of that property about a year later. Issue 7-Potatoes Not Worth Digging: The 1863 Personal Inventory of Paul Freund. This column analyzes an 1863 estate inventory from Davenport, Iowa, paying particular attention to clues that might provide details about Paul's occupation and origin. Issue 8-We Were at the Wedding: A Civil War Pension Affidavit. This column looks at an affidavit made out in California in the early 1900s regarding a marriage that took place in Michigan nearly fifty ears earlier. Accuracy of information along with research suggestions are included. Issue 9-Finding William and Rebecca in 1840. Discusses a search for a couple in their first census enumeration as man and wife. Issue 10-More Brick Walls From A to Z. Another installment in our popular series of brick wall techniques from A to Z. Issue 11-Mulling Over a Deposition: Testifying For a Fifty-Year Neighbor. This column analyzes a deposition made in Revolutionary War pension case where the deponent has known the applicant for fifty years. Plenty of clues and leads to analyze in this document. Issue 12-An 1836 Kentucky Will. This column includes a transcription and an analysis of an 1836 Kentucky will. Issue 13-An 1815 Marriage: Augusta Newman and Belinda Sledd. This column analyzes a marriage register entry and marriage bond for this couple in Bourbon County, Kentucky. Issue 14-Going Back: James and Elizabeth Rampley in 1850. This 1850 census enumeration is completely analyzed for clues on this apparently well-documented family. Issue 15-Selling My Part of My Father's Farm: An 1820 Deed From Maryland. This column looks at a Harford County, Maryland, deed where Thomas Rampley transfers his ownership in his father's farm to his brother. The relationship is not stated in the document, but all clues are completely analyzed and research suggestions given. Issue 16-At the Baby's Birth in 1859. This column looks at a proof of birth for an 1859 birth as given in a Civil War children's pension file. Issue 17-Dead or Alive: G. W. Garrett? This column looks at a transcription of a guardianship order contained in a Union Civil War pension application. The document is somewhat unclear and indicates that further research is necessary. Issue 18-From a Life Estate to a Fee Simple. This column looks at an 1880 era deed that essentially converts a wife's life estate in a ten acre parcel into one that is a fee simple title. Of course, the deed does not explicitly state that. Issue 19-An Estate of Inheritance: Benjamin Sells His Forty. This column looks at an 1840 era deed from Michigan. Interpreting boilerplate text must be done with care. Benjamin left few records about his origins and this one is maximized for all the clues it contains. A complete list of issues is too large for this email--check our our complete list here. Casefile Clues prides itself on being readable for all levels of genealogists. We have "newbies" and seasoned researchers among our subscribers. Our style focuses on reflecting accurate methodology, sound research, and a clear explanation of WHY research was done the way it was. Casefile Clues is not just about summarizing the answers, it's also about the research process and analysis used to get there. We stress readability. In fact, we've had readers say that they get more out of Casefile Clues than some journal articles for that very reason. We're not trying to impress some editor or academic. We're trying to help the reader and share our experiences in a way that makes the research process take priority. I took the course “Advanced New England Research” at the Salt Lake Institute of Genealogy in 2012, coordinated by D. Joshua Taylor, MA, MLS with David C. Dearborn and Rhonda McClure, both of the New England Historic Genealogical Society (NEHGS). A similar course will be offered at SLIG 2015 entitled “Diving Deeper Into New England.” Mr. Taylor is now the Data Strategy Manager for findmypast.com (owned by DC Thomson Family History) and intends to revamp the course significantly. So, should you consider attending? I live in downtown Boston – Beacon Hill. I am a ten-minute walk from NEHGS, a fifteen-minute walk to the Massachusetts Historical Society, and a quick drive (or T ride) to the Massachusetts Archives and Registry of Vital Records. Other important archives and collections are an easy drive as well. Why then would I travel to Salt Lake City to take a week long course in New England research?! First, I am unaware of such a lengthy and in-depth course offering here in New England. Second, as a veteran SLIG attendee, I know that the courses will offer me new perspectives and insights, even on subjects I know well. In the 2012 course, I learned so much about New England (not my native region) and the numerous interesting collections throughout. Josh Taylor has extensive experience with these records and attracts other lecturers who also have insights and information to enlighten even the most seasoned of researchers. In 2012, an overview of New England town records was given to familiarize attendees with the richness and peculiarities of such records. Several of the tracks focused on the many manuscript collections, archives, college and university libraries, and historical societies that exist throughout New England as well as informing attendees of the vast holdings of newspapers and court records that exist in these states and online. Genealogists were reminded of the long history of the New England states resulting in the creation of various collections, large and small, that one should not overlook. The course also included a series of lectures on advanced strategies particular to each of the six New England states: Massachusetts, New Hampshire, Connecticut, Rhode Island, Vermont, and Maine. Each attendee also had the opportunity to meet individually with each of the lecturers about particular brick walls or issues from their own research (these could be submitted in advance). Several of the days dismissed early so attendees had ample opportunity to work in the Family History Library and explore some of the strategies learned in the course. Searching high and low was strongly encouraged and revealed to be more than possible in New England. I came away excited with many new places to look for my New England ancestors and can report several successes! Teresa L. Scott has been researching her family for more than 15 years taking her all over New England, the Mid-Atlantic, and the Midwest. 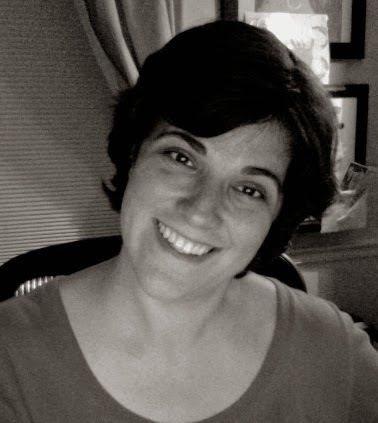 She is a 2009 graduate of the Boston University Genealogical Research program and completed the ProGen Study Program in 2010. She serves as State Records Director of the Massachusetts Genealogical Council working to preserve access to public records.